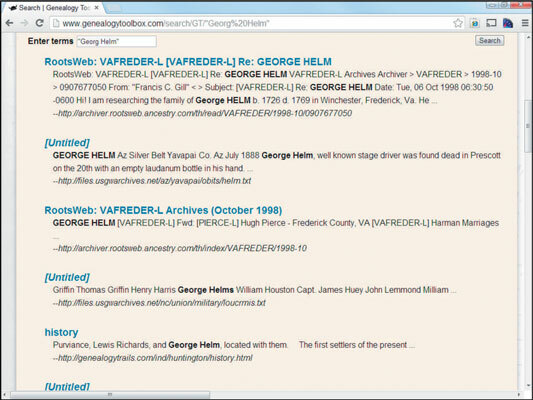 One way to maximize your genealogy research time is to use a vertical genealogy search engine. A vertical search engine is a site that indexes content about a specific topic rather than attempting to index the entire web. So, in theory, the results from a genealogy vertical search engine should contain things that pertain to genealogy and local history. The challenge for the owners of vertical search engines is to ensure that the content that is indexed by the bot is consistent with the topic. That means that the maintainers of the search engine must screen the sites that are included in the index, either through the technology or by indexing only particular sites. Two vertical search engines to look at for genealogy and local history are Mocavo and the Genealogy Toolbox. Point your web browser to Mocavo. The Mocavo home page appears with a box to complete if you wish to create a free account. Click the Search link at the top of the page. Type the ancestor’s first and last names in the appropriate text boxes. If you want to fine-tune the results, try placing a location where your ancestor lived in the Keywords text box. You may have to click the X on an advertisement for the Mocavo subscription services before you can see the results. The results page should appear. The Mocavo results are a mixture of results from its subscription content and content on the web at large. So, some links lead to a subscription pop-up box, and others go to a site on the web. As of the time this book was written, a lot of the subscription content is freely available online at locations such as the Internet Archive. 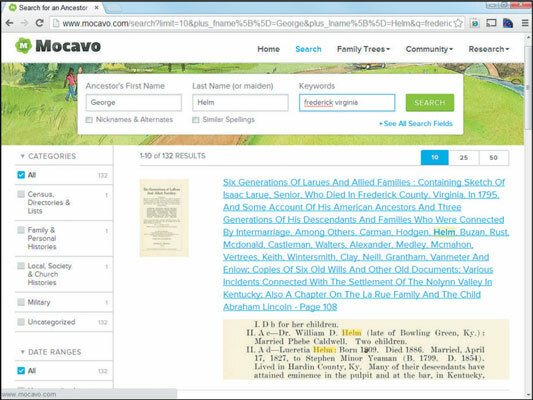 The value-add at Mocavo is the better search interface and results that are more genealogically related. If you don’t want to pay for the subscription searches, you could use Mocavo to discover the record that your ancestor is mentioned in, note the page number, and find the corresponding record on the Internet Archive. The Genealogy Toolbox has been around since 1994. It began as a list of links to genealogy and local-history resources and added a search engine in 1998. Today, the focus of the free site is on the search engine and in preformatted searches. The Genealogy Toolbox home page appears. Under the section labeled Genealogy Toolbox Full-Text Search is a search box. Type your search terms in the search box and click the Search button. For hints on search syntax read the information located above the search box. The search results appear. Click on a link that interests you. You can also use the preformatted searches located on the home page to reduce the amount of time spent searching. These preformatted searches appear as links in the Search Categories text box located just below the search form.